Ready to be part of the best gay pride on the beach in Italy of the year? Italy Gay Travels is proud to invite you to Italy Gay Summer Party 2018: a 3-day event packed with fun, sun, laughs and Prosecco, obviously! Book now your Early Bird Tickets: Discounted Rates end soon! After last years’ success, Italy Gay Summer Party 2018 is back. Bigger, better and with even more fun. 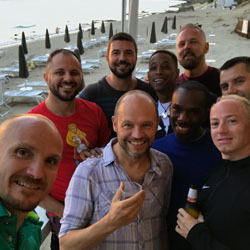 Join a selected group of avid gay travellers basking in the sunshine and beaches of Gallipoli, Puglia for the gay party of the year, 31 August to 2 September 2018. Italy Gay Summer Party 2018 is held in the heart of Puglia, an awe inspiring natural landscape in the southernmost tip of Italy (sunshine guaranteed). Amazing food, Caribbean-like sandy beaches, hot boys and friendly locals… should we go on? Each morning, our guests will have plenty of options to choose from. They can relax while taking a stroll along the windy streets of the old town of Gallipoli; sip cocktails by the pool or head down to the beach. Pride attendees guests will receive unlimited VIP access to Lido Por do Sol, the only gay-run lido in Gallipoli bay. Lido Por do Sol is set on a beautiful long stretch of sandy beaches and has relaxing chill-out music throughout the day. Excellent cocktails and great local food will be the perfect complement for the day. On Saturday afternoon, the highly-anticipated Gallipoli Boat Gay Pride Party sets sail. Up to 100 local and international men from all over the world will enjoy an unforgettable boat party packed with sun and fun! Italy Gay Travels’ charter boat will make its way in the port of Gallipoli and drift around its beautiful bay. You can jump on and off at will and swim in its turquoise waters. There will be a welcoming glass of Prosecco followed by white wine or soft drinks and light appetizers. The boat ride will last around 4 hours. DJ beats will be playing while Italy Gay Travels hosts this fun filled boat ride. On Saturday night, the Official Pride Dinner is an Al fresco dining experience like no other at Matador Brasserie! With the finest selection of grilled meat available, your mouths will be drooling with the smell of local Bombette and sausages. Now now boys, there’s plenty to share for everyone. Soon after the Official DInner, the Italy Gay Summer Main Party will kick off with Pride at Picador Village. Picador is the biggest gay club in Southern Italy: the best beats will be brought to Italy by international DJs. This all gay village is set outdoors with amazing stage areas: a unique party extravaganza our guests will never forget. Amazing DJ sets will keep those moves busting all night long. The venue is very popular among the ‘local talent’! On Sunday afternoon Lido Por Do Sol will be the main stage for the Explosive Closure Party of this amazing Pride festival, right on the sand of the beautiful beach of Gallipoli. Our DJs will keep our guests moving on the beach all afternoon with their best beats! It will be a sunset not to be forgotten. So, are you still thinking? Join us with Pride for the best Gay Party on the beach of Italy this Summer. Early Bird Tickets Sale ends very soon: book now to avoid disappoinytment!